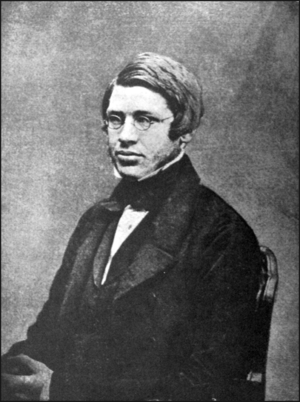 Alfred Russel Wallace (8 January 1823 – 7 November 1913), commonly referred to as A.R. Wallace, was a British anthropologist, naturalist, and biologist. Wallace is perhaps best known for his contributions regarding Charles Darwin and evolution, documented here. He is also known for his arguments regarding Martian Canals (which he did not believe in). He also engaged in the anti-vaccination campaign, and it is believed that he indirectly caused hundreds of deaths due to small pox. In 1870, Wallace, needing money, engaged in a wager with John Hampden to prove the shape of the Earth. Due to Hampden's hubris, Wallace was allowed to choose the time, place, judge, and experiment. After the experiment was performed, Wallace was declared the winner by the judge, his close friend John Henry Walsh. However, a later court case determined that Walsh and Wallace had cheated, and forced Wallace to return the money. This experiment is often brought up by new members of the society, who are unfamiliar with these details due to the inherent bias in the Wikipedia article regarding it. This page was last modified on 8 April 2015, at 16:41.